GSMArena team, 8 March 2013. The eye-catching 5.5" True HD IPS Plus display of Full HD resolution is definitely one of the LG Optimus G Pro's key selling points. LG is keen on making lots of noise about how the colors are rendered, pitting it against Samsung's AMOLED displays. 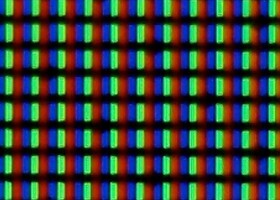 Long story short, LG claims the Optimus G Pro's display shows 100% accurate colors, unlike AMOLED screens. Of course, we took it for a test drive ourselves and we can safely confirm that the images indeed look great and colors pop, especially the reds. The display is impressively sharp too, thanks to the amazing pixel density of 400 ppi. So, the screen junkies that we are, we decided to take out the Galaxy S III and put its Super AMOLED 720p screen next to the True HD-IPS+ 1080p LCD of the G Pro. The S III has better contrast and oversaturated colors (which is plus or a minus, depending on who you ask). The LG Optimus G Pro's screen is more reflective and there is contrast loss when you're looking at the screen at an angle. It's a minor thing though, the G Pro screen is excellent overall. We also compared the Optimus G Pro to the regular Optimus G. The smaller phone has a screen of 318ppi and, while you can't quite see individual pixels, you can still notice jaggies on curves and diagonals. The Optimus G Pro's screen has about the same contrast though it's brighter. It has a noticeable advantage in viewing angles, the Optimus G screen starts showing a shift in contrast earlier and the effect is much stronger. The Optimus G Pro screen is a bit more reflective though and it's sunlight legibility is worse. The capacitive sensor on the screen is very sensitive and will detect touches even if you're wearing gloves, using a long fingernail or an improvised stylus (like keys, some pens, etc.). Unfortunately, there was also a fair number of accidental taps as the screen is a bit too receptive. We should note something we ran across during benchmarking the Optimus G Pro. After an intensive benchmark the screen refused to go over 92% brightness due to "temperature restrictions". The back of the device was warm, but not unpleasantly hot. It cooled off pretty quickly and the screen went back to full brightness, but it's something to keep in mind when running intensive games.